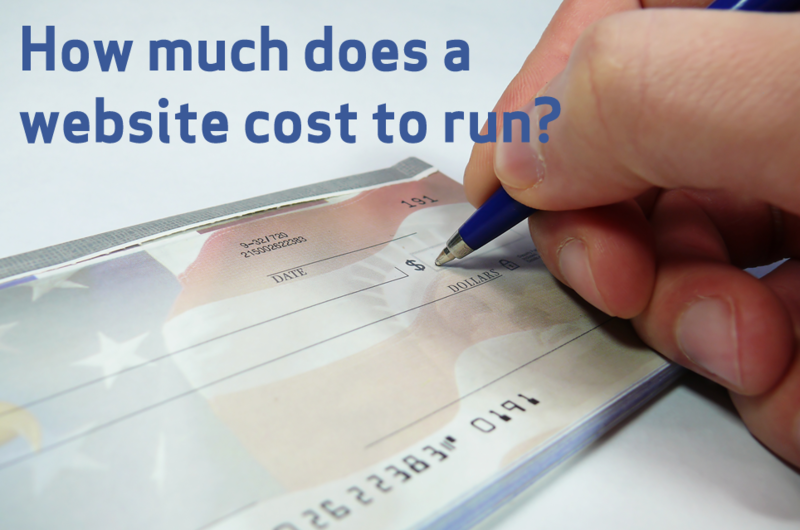 You are here: Home » How Much Does a Website Cost to Run? The cost of running a website largely depends on a number of factors, such as your web hosting provider, levels of traffic (or expected traffic), domain name registrar and software requirements. If you are unsure of your budget, here are a few things to consider. There are many different types of hosting packages and options available. If your website is small and doesn’t get a lot of traffic, Shared Hosting is usually the most cost effective options, and usually costs under £10 / month (dependent on package selected). The trade-off is that the server is shared with other customers – usually a few hundred other websites. If you are after more flexibility and control on your hosting environment, and expect thousands of unique visitors a month, a Dedicated Server is probably your best option, but at a cost. Depending on your provide, Dedicated Hosting will cost you at least £80 a month, and will easily climb to £200-300 / month if you opt for a managed service, backup options etc. With Managed Dedicated Hosting, the hosting company will maintain the server on your behalf, updating the software on a regular basis and keeping the server secure and running. It also gives your priority support for any issues you may experience. This is a recommended option of you don’t have a in-house Systems Administrator / Dev Ops person. Finally, Cloud Hosting is a compromise between Shared and Dedicated hosting, giving you affordable hosting (like with Shared hosting), but with the flexibility to customise the software or settings (like a Dedicated server). Cloud Hosting also means you can easily increase (or decrease) the power of your server depending on the traffic you get. If you’re starting a new website, have a reasonable budget of £100-150 / year for Shared Hosting. For Dedicated Hosting, you’ll need a minimum budget of £1200 / year. Depending on your registrar and the type of TLD you have (i.e. .com, .net, .co.uk, .mobi, etc), a domain name will cost you around £10-15 a year. If you opt for extras like privacy protection (or ID protection), forwarding / parking etc, you may have to pay extra – easily doubling the yearly cost. Naturally, if you have more than one domain name, the cost is multiplied by the total number of domains you have. In most cases, the domain name is the cheapest aspect of running a website. Allocate £10-20 / year per domain name. This cost is likely to be higher if you have something other than a .com, .co.uk, .net, .org, .info, or .mobi name. Bandwidth is the amount of data you’re allowed to consume when visitors visit your website. Loading text, images, videos, music etc. all consume bandwidth. With Dedicated Hosting, you’ll get a large amount of bandwidth included, usually at least 1-2 terabytes per month. With Shared Hosting, there isn’t normally a limit, but the Hosting provider may have a fair-use policy to govern this. As for Cloud Hosting, you’ll also have an initial limit, and any bandwidth over the limit will be charged. For example, Amazon Web Services offers the first gigabyte of bandwidth for free, and all additional bandwidth is charged at $0.12 per gigabyte (dependent on region). No additional cost here, unless you opt for Cloud Hosting or intend to host videos, music, or photos, which will consume a lot of bandwidth. Most new websites will easily remain within the initial bandwidth limits. If you plan on running an e-commerce website or need secure pages, you’ll need an SSL certificate. If you’re after a basic SSL certificate protecting one domain, you can expect to pay around £30 / year. If you want to secure multiple areas or subdomains on your website, you’ll need a Wildcard SSL certificate, available from £80 / year. Some hosting providers may give you a free SSL certificate with one of their higher price plans. You should see if the free SSL certificate and higher price plan is value for money (the premium plan will also include other benefits). Minimum of £30 per year. Dedicated Servers and Cloud Servers will usually have a dedicated IP address as part of the monthly cost. With Shared Hosting you’ll be sharing an IP address with hundreds of other websites. If you want an additional (or a dedicated one if it’s not part of your package), it will cost you £2 / month. With Amazon Web Services, for example, you will get one free IP address if it’s linked with a EC2 server. Unlinked or additional IP addresses will be charged at $0.005 per hour. A dedicated IP address is required for SSL Certificates. Each domain name will need a dedicated IP address if you plan on securing them with SSL. Free to £2 / year per additional IP address. Some of the software you use on the server may require a one-off or annual license payment. For example, using off-the-shelf forums software like IP.Board will cost you $175 for a license and limited support. Using server software like cPanel will cost you around $425 / year on a dedicated server, but cheaper if your hosting provider provides a license. Variable, depending on the number of software packages / licenses you need.